For a delightful hideaway in the foothills of the Drakensberg Mountains, Sandford Park, a KwaZulu-Natal country hotel, is just the place to be. Tucked in between the central and northern Drakensberg, this country estate in KwaZulu-Natal is the ideal holiday, wedding or conference venue with great facilities and views. Sandford Park a KwaZulu-Natal Country Hotel, is conveniently located between Durban and Johannesburg; it is easily reached from the N3 highway and superbly positioned in the foothills of the Drakensberg Mountains, a World Heritage Site. Guests at Sandford are accommodated in 50 stylish thatched en-suite rooms as either cottage style or Executive suites. The Sanford Park Country Hotel is a family-friendly hotel and the attentive staff will make you feel welcome. There is a lovely Honeymoon Suite and also romantic rooms with fireplaces which are extremely popular. 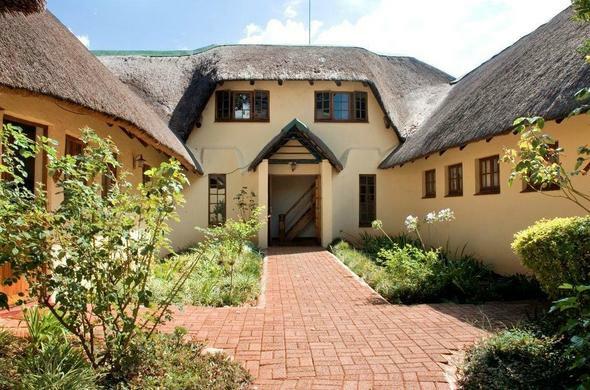 Sandford is set in 41 hectares of beautiful scenery with natural springs and streams; there is a well stocked dam, fabulous views and hiking trails. There are a number of recreational activities available both indoor and outdoor to keep everyone satisfied, or guests can relax by the pool and enjoy the well manicured gardens. Guests can enjoy the charming and historic pub and savour excellent meals in the cosy dining room. There are 2 private fully customised conference venues available seating up to 30 in the smaller venue and up to 80 delegates can be accommodated in the larger venue in a stress free and tranquil environment. Weddings are a speciality with an unusual thatched chapel overlooking the serenity of the dam and mountains; there are also gorgeous rose gardens and manicured lawns to provide the perfect setting.